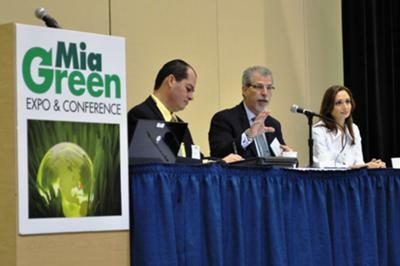 MiaGreen Expo & Conference, is the only event in the United States providing access to the ever-growing, non-stoppable green, renewable and sustainable markets for ALL the Americas. This annual, well-established, business-to-business event is one-of-a-kind and grows bigger and better every year. With its unique marketing mix (80% US + 20% Latin America & the Caribbean), MiaGreen has developed as the one-stop, all-inclusive, interactive conference and marketplace for SUSTANABILITY, combining a major trade show with front edge extensive educational and networking programs. By EXHIBITING in & SPONSORING MiaGreen 2013 you target Southeast US and/or Latin American & Caribbean well established and emerging top markets in the hottest spot at the right time. By ATTENDING MiaGreen 2013 you meet major suppliers, get the best deals, increase your professional value, connect with innovation and uncover top business opportunities at local, regional and global scales. Attendee on-line registration at unbeatable rates starts on September 2012. Complete info at www.MiaGreen.com. For assistance mail@MiaGreen.com or call (305) 412-0000.